Providence, R.I. Roger Williams Statue and Betsy Williams Cottage - Roger Williams Park. Unused. 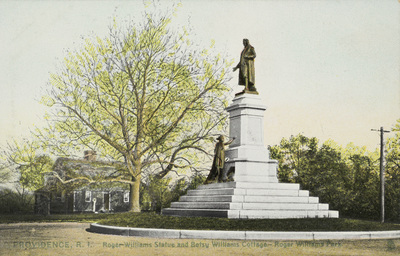 Caption: "ROGER WILLIAMS STATUE AND BETSY WILLIAMS COTTAGE. The Roger Williams Statue was erected by the city in 1877, and stands on a plateau in front of the old Betsy Williams Cottage. The sculptor was Franklin Simmons, and the lower figure represents History inscribing the name of "Roger Williams, 1636." The cottage was bequeathed with 101 acres of land by Betsy, a lineal descendant of Roger, to the city for park purposes." Raphael Tuck & Sons', "Providence, R.I. Roger Williams Statue and Betsy Williams Cottage - Roger Williams Park." (1915). Rhode Island Postcards. 416.